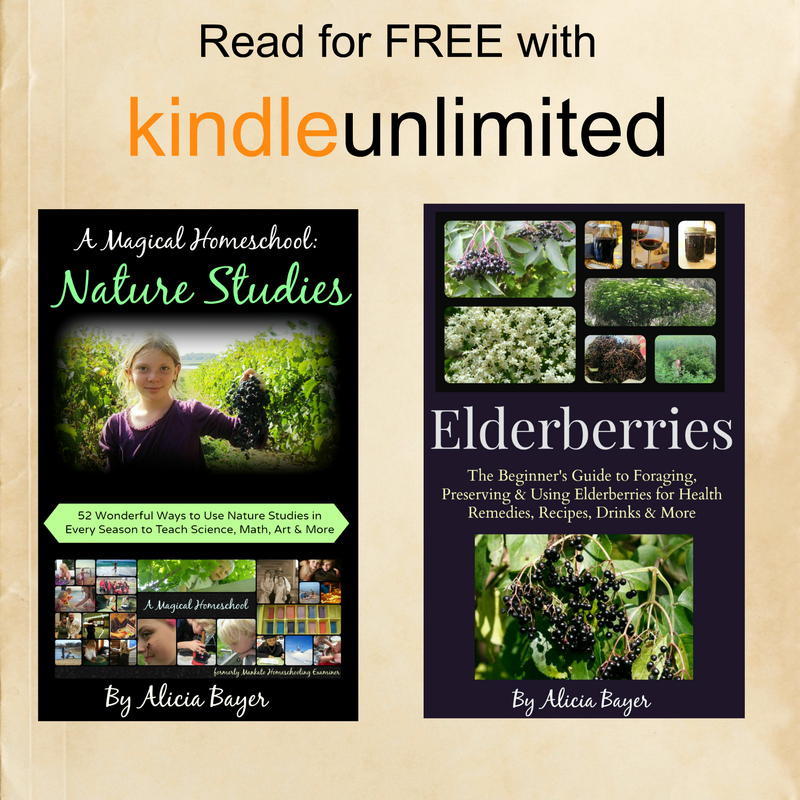 If you’re a subscriber to Kindle Unlimited, you can read my books, Elderberries: The Beginner’s Guide to Foraging, Preserving and Using Elderberries for Health Remedies, Recipes, Drinks and More (with over 60 recipes for health remedies, desserts, jellies, wines, liqueurs and more), and A Magical Homeschool: Nature Studies (52 Wonderful Ways to Use Nature Studies in Every Season to Teach Science, Math, Art and More) for free! I’m enrolled in KDP on Amazon, which means these books are only available through Amazon and if you subscribe to Kindle Unlimited you can read them (and over a million other titles) for free. We’ve been subscribed to KU for a few months and I’ve found a lot of great books for myself and the kids. I started a Facebook group, Homeschooling with Kindle Unlimited to share good homeschooling books available through KU if you’re looking for new titles, too. You can find out more about Kindle Unlimited here, and also sign up for a free 30 day trial (which is what we initially did to see if it was a good fit and then we decided to keep it). Please leave comments about good books you know of in the program or subjects you’re interested in! My Kindle book went live on Amazon this morning! 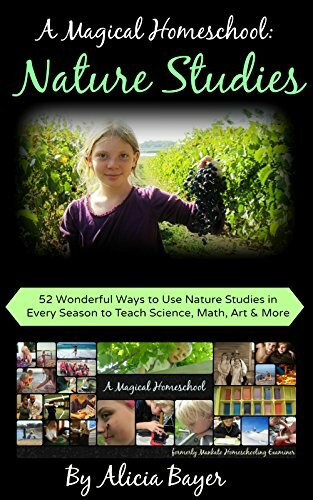 You can find it here: A Magical Homeschool: Nature Studies (52 Wonderful Ways to Use Nature Studies in Every Season to Teach Science, Math, Art and More) (affiliate link). It’s broken down into four seasons, with 13 activities for each season (enough for one every week of the year). They are designed to work with multiple ages, so families can do the activities together. Test your garden soil pH with vinegar. Make homemade playdough and dye it with a variety of natural materials to make all different colors. Use an empty Valentines Day chocolate box to start a rock collection. Count cricket chirps to tell the temperature (with information about how crickets make the chirps and why they speed up when it’s warm). Use a magnet to find micrometeorites at the beach. Use ants for nature studies (draw a chalk maze to see if they’ll run it to avoid the chalk lines, watch how they’ll follow an invisible path on a piece of paper if you turn it after they start walking a line on it, test out various natural repellents, etc.). Use glycerine to preserve a branch of colorful fall leaves. Use apples for a variety of science and nature (and homemaking) projects. Measure the volume of snow when it’s frozen versus melted (and extensions from there). Make a tabletop observation garden from root vegetables. It’s $2.99 in the Kindle store, or free if you subscribe to Kindle Unlimited. It should be free sometime soon and I’ll post and let you know when that happens. If you’ve ever tried to put together your own chemistry kit for homeschooling, you know what an overwhelming (and expensive) task it can be. 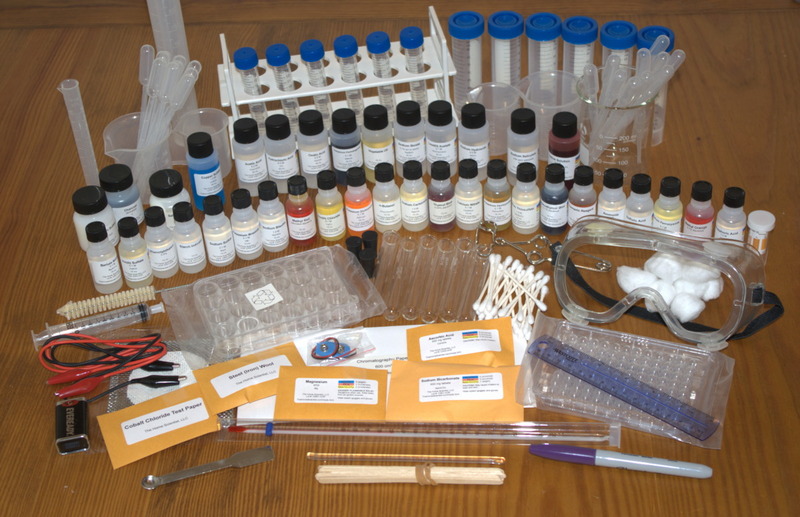 A new chemistry kit is now available to make it easier and more affordable for homeschoolers. The CK01 Chemistry Kit contains everything needed (other than a few basic supplies like table salt) for a one year chemistry course, along with lecture notes. I have not tried the kit and have no affiliation with the company, but it sounds like an easy and affordable way to assemble a pretty thorough year of chemistry. The kit now costs $184, with shipping available at an additional cost to countries such as Canada, Great Britain and Australia. For a student who will go on to major in college in chemistry or another science, the kit provides a rigorous, comprehensive first-year chemistry lab experience. For non-science majors, you can, at your option, reduce the rigor and scope of the chemistry lab experience simply by doing only selected core lab sessions, while still providing an essential introduction to chemistry lab concepts and procedures. 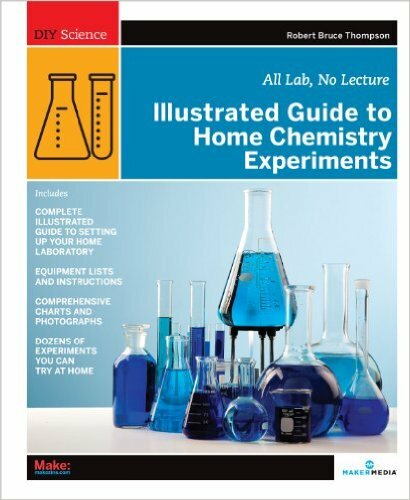 I still have not tried the kit myself, but I have tried the book that it was created to accompany, Illustrated Guide to Home Chemistry Experiments: All Lab, No Lecture (DIY Science) (affiliate link), and I love the book! This is truly a book for kids who want to do real science with real materials. I loved reading about how the author discovered science as a child and how he worked to create a chemistry kit like those of his youth, before they were so “dumbed down.” The book makes for a very thorough chemistry course/lab, and it is perfect for kids who love science or for kids who want to love science. The book is not necessary to use the kit. It comes with a complete PDF manual. I do recommend the book in addition, just because it’s such a fantastic, thorough resource. If anybody out there has used this kit, I’d love to hear your experiences with it! 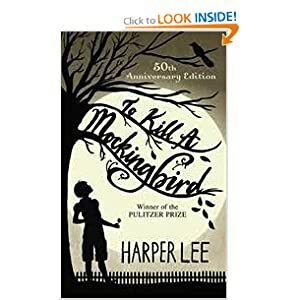 On July 21, 1998, the Radcliffe Publishing Course compiled and released its own list of the century’s top 100 novels, at the request of the Modern Library editorial board. Victoria has read at least 5 of the top 25 this year as part of her 9th grade reading plan and on her own (1984, The Catcher in the Rye, Animal Farm, Lord of the Flies, To Kill a Mockingbird). I’m not sure how many she’s read of the next 75. My own tally for how many I’ve read is shockingly low… about ten that I remember. Several were on my reading lists in college and I managed to completely BS my way through all of the discussions, tests and essays without ever reading them. College was a terrible time for me to actually try to learn anything, since I was so overwhelmed with life during that time. I started college at 16, was married by 18, worked full time and then some, and navigated a rather brutal few years of tragedies (my aunt’s murder, my mother’s prolonged terminal illness, my own miscarriages, finding my long-lost father after he’d already died, and so on). Heart of Darkness just wasn’t a priority, even if it was supposed to be. What about you? How many have you read? Which ones would you add? Is your homeschooled high schooler looking for great electives that count towards graduation, look good on a transcript and are also interesting? Which countries have banned homeschooling? Free educational magazines from Early Knowledge for Kids! Which stores and seafood companies have pledged to avoid GE salmon? I’ve just started on a suggested reading list for Anna’s 7th grade year. Here’s what we have on it so far. She’s reading The Secret Garden right now and really loves it. I believe she’s read most of Little Women, too. My Kindle is great for finding classic children’s books for free! There’s a mix of fun and serious, historic and fantasy. I still want to look into more lists online and talk to her about other books she’d like to add. I’d like to add more good books with boys as the main characters, more historic fiction and some modern classics. She’s already well acquainted with all of the Harry Potter books, the 39 Clues books and several other modern anthologies. She also reads constantly on her own for fun, including modern fiction and lots of mythology, so she’ll continue to read her own choices. We’ve finished up our 9th grade suggested reading list for Victoria for next year, with input from various friends online, web sites, my own suggestions and Victoria’s requests. She does not plan to read all of these, just a good portion. We’ll discuss them as she goes and she may write reviews for sites like Amazon.com and write a few essays throughout the year comparing one to another, analyzing the meanings, etc. I’m sure she’ll read many more besides the list and she’s got a log started to keep track. These are the ones that seemed like good ones to focus on, though. She also already read Farenheit 451 (in less than a day, she was so caught up in it) and absolutely fell in love with the book. She now wants a copy of her own and has dubbed it one of the best books ever. I’m not doing much homeschool planning right now because the baby will be coming in early October (October 10th is the official date!) and I’m not naive enough to think I’m going to stick to a rigorous homeschool schedule with an impending birth or new baby. That said, I’m doing up some general goals for the kids and that includes a reading list for the girls. Having been forced through Heart of Darkness in college didn’t do anything to change my life for the better, and I want to keep my kids passionate about reading. There are enough books that they have loved that I don’t mind if they occasionally veto one or two. That said, here’s my tentative list for each of the girls. For the boys, I just want them to continue to read lots of books (or be read to) and love books. I’ll pick out books from the library to strew as much as possible, too. I’m also planning on teaching a poetry writing unit to the kids for much of the year. I was a poet in my younger years and both girls have shown a recent interest in writing poetry. I really like pulling out books and journals to show the girls my poems published long ago, and I miss my days of teaching poetry. I think we’ll have a lot of fun with it. Do you have any plans for books for your kids this year? Any titles that are on your must-read list for kids? I’d love to hear some more suggestions!